The beginning of summer is my favorite time of year. It does not hurt that I am a teacher and look forward to some personal time, but it is a time to rejoice for everyone especially in the music world. Festivals start to catch wind, and the discovery into new and old music becomes an inspiration that one will always look back on. In the musical utopian land that Boulder is, there is a new venue for the eTown show that is reminiscent of church, since that is where it is located inside of. On its website it states,“For the first time in 21 years, eTown finally has a home of its own. eTown Hall is a multi-purpose building in the heart of downtown Boulder that is not only home to eTown’s offices, but also a world-class live music venue, full service recording studio and a real community center.” eTown used to be recorded in the Boulder Theater, but now that it has its own acoustically sound home, the intimacy and elegance has increased. What could be better to see in such a acoustically sound venue than a musician that has his own genuine twang in not only his guitar, but his amazing voice? 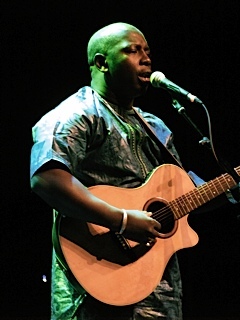 Vieux Farka Toure, son of the famous Malian Ali Farka Toure, has a natural beauty in his music which sounds so pristine and pure that it makes a reflex inside feel like you want to smile and cry at the same time. It is truly religious! The opener was Maxwell Hughes, most famous for his stint in the surging band the Lumineers. Hughes had a warm, funny personality, and after he expressed his pleasure for being here and said he was from Ft. Collins, he began his soft instrumentals. His first song was entitled, “No Name,” and he joked about his lack of song title creativity, and the next song being called, “Nameless,” although it's real name was “Steam Machine.” He talked about leaving the Lumineers for his desire to grow and travel. He spent a lot of time in Costa Rica playing chess and playing guitar. It was evident in his complicated music signatures in “Komikaze” and “Rain Waltz,” which usually comes with a beatbox introduction to get the attention of large crowds in bars. That was not needed here. This crowd was very attentive. And then came the cowboy train robbing music and the Fleetwood Mac cover “Big Love.” Hughes' music is obviously influenced by Lindsey Buckingham and Kaki King. Hughes' bluegrass number, “Winfield” came next along with a story about winning third place in a pickin' contest. He won the guitar that he was playing, kicked into “ghetto bass mode” and played the first song of his new album, “Tales of the American West.” “Slappy Do” and “Ode to Kaki” were all about the great Kaki King, and “Flat Cat” my girlfriend and musician Ashley Touseull commented was fully of minor thirds and blues riffs mixed with wild west bass beats,” which sounded like James Bond theme music teases to me. After a short break and stage change, Vieux Farka Toure and his band came quietly on stage to play two of the most beautiful songs that I have ever heard. The band is currently out touring for two main reasons. 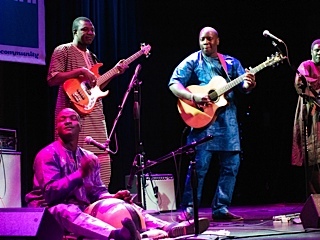 One is to promote their new album Mon Pays (Six Degrees Records), and the other is to raise money for their country Mali, which has been at war over territorial fighting between Tuareg and Islamic rebels since 2012. Toure has made it clear both at this show and elsewhere that he wants to remind the world about the beauty and culture of his homeland. 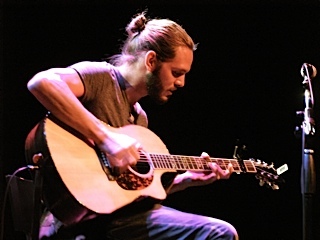 After he welcomed the crowd in his very limited English, they played two more very beautiful echo resonated songs that sounded even better in this acoustic paradise of a venue. They decided to play acoustic this time because as Vieux said himself, “Music doesn't always have to be blangblangblang you know?” And he is right. Even though I really enjoy his guitar sound plugged in, it was absolutely gorgeous acoustic. Toure talked a lot about the situation in Mali. It was apparent that his heart is there and full of peace. He recently said, “For me it is a statement for the world that this land is for the sons and daughters of Mali, not for Al Qaeda or any militants. This land is for peace and beauty, rich culture and tolerance. This is our heritage, what we must always fight to protect in any way that we can. For me, that means making music that reminds the world of who we are.” The show was full of mixed feelings including the most fun part when Toure told the crowd to stand up and dance, while demonstrating hip shaking from side to side. Our spirits were lifted into a world of peace and harmony. The sheer power and signature sound of his guitar is transformational to the spirit. It speaks to one's insides. There were a few more dancing songs, and then Toure reminded the crowd that ten percent of all of his cd sales go to orphans in Mali. He then taught us the name of the drum that their drummer was playing on the ground. He said, “That is a calabash, and after we eat it, it turns into a drum.” The crowd got a chuckle from his humor and admired the gourd, which also sounded amazing acoustic. It acted as a bass drum or a snare type sound when smacked with sticks. For his encore, the crowd was up singing, dancing, and clapping, and it felt like church in eTown. I'm pretty sure that the final song was “Yer Gando,” which featured this call and response style vocals, and Souleyman Kane's calabash rhythm, which warns of foreign invaders robbing Mali of its heritage. After all, the conflict in Mali includes the evil Taliban banning music and re-establishing slavery. This tour and record mean a lot to Vieux Farka Toure in many ways, therefore, he can use all the support that he can. Furthermore, the album and his live performances are not to be missed.